In the game of online document editors Google plotted their mark with the Google Docs which is more productive to all gmail users to edit their documents online without installing any document editing softwares. By following up Google, Apple also launched iWork, a web versions of their Pages (Document editor), Keynote (Presentation editor) and Numbers (Spreadsheet editor) last year. Microsoft is now in the game for quite time, but its not a huge thing to the people. Now Microsoft made their move by launching their Office.com web apps and it also joins the productivity suite party, a bundles with the collection of small more changes and improvements. Few days back Microsoft rebranded their SkyDrive to OneDrive, as a move of the rebranding Microsoft launched office.com to compete with google’s Drive and Docs. Will see whats special in Microsoft Office online and OneDrive. Lets compare the efficiency of Office 365 with existing legend Google Docs . As per the chart office online / 365 leads the Google Docs. Office online GUI is very similar to that of latest version of MS Office.So its very easy to understand the concept and the options available under the office online. Compatibility, a strong and powerful thing what the user need. If you want to edit or view the offline document created with MS Office using web app, Office Web app is the apt thing. 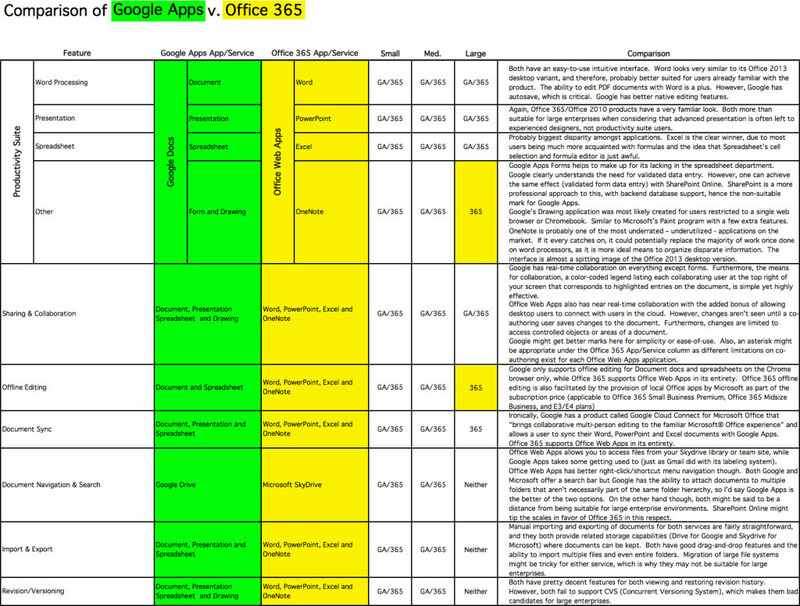 Compatibility is the only reason which makes the office web app ahead of Google Docs. Office web app doesn’t miss any of the content created with the MS office. You can clearly understand from the image how Google Docs miss some of the layouts which presented in the original document. Hope Google may take this into account and may fixed their compatibility issue until that Office Web App leads the Google Docs. Similarly lots of things Google Docs failed to display the original content of the document created with MS Office in their viewer. Apart from this compatibility issue Google Docs Stick to its already owned position as its the online document editor available as web app and also available at free of cost. Even Office Online also available as a free app the grace over Google Docs will not let it down.